1. What is the SMSTurbo Online SaaS offering? SMSTurbo Online is a web-based scale ticketing application. It allows scale operations in the Aggregates, Waste, and Recycling industries to perform ticketing at their site in an easy-to-use web interface. Staff can create and manage tickets online through a company dedicated portal. 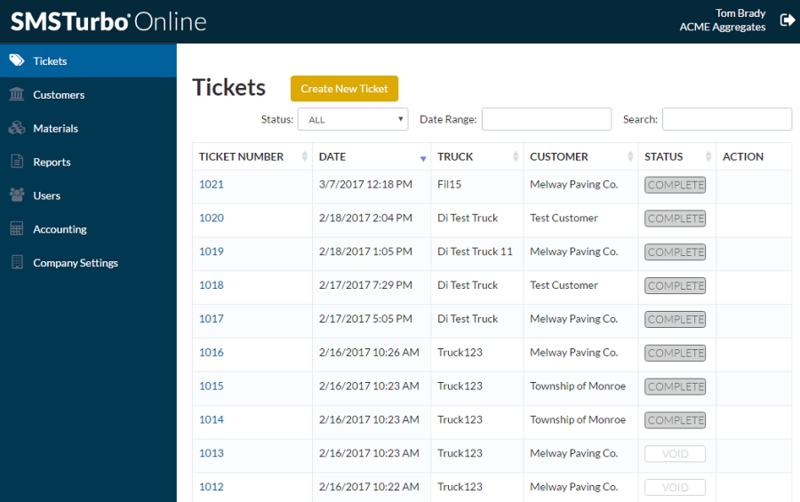 Saved customers and materials allow for quick look up during the creation of a ticket. Input weights or quantities for a single material or multiple manually or in a streamlined method. Fields can be populated from a scale indicator using hot-keys and our ScaleCom application. Ticket data can be printed to thermal receipt printers for customers, output in standard report types, and exported to create invoices automatically. 2. What are the benefits of a SaaS product? Software-as-a-Service is a modern product delivery method for software. SaaS allows for tools readily available online. There are no major IT or hardware requirements. All you need is a computer with an internet connection and a web-browser. The added benefit of SaaS offerings is the developer’s ability to make rapid and constant improvements and updates without major customer disruptions. 3. Will this integrate with my accounting system? SMSTurbo Online has a direct integration with QuickBooks Online. You can export tickets from SMSTurbo Online into QuickBooks Online through an API and automatically create invoices. 4. What’s the difference between SMSTurbo Online and the desktop product? Our flagship product, SMSTurbo, is a comprehensive scale management solution used by a variety of businesses large and small to manage attended and unattended operations. The desktop version is a full-featured and highly configurable application. As the most flexible ticketing application it supports several accounting integrations, provides detailed reporting options, and can be tailored to meet the complex needs of almost any business that employs an industrial scale. If you have unique business processes or specific needs, please read more about SMSTurbo Features and Add-ons. 5. Is it possible to upgrade from the SaaS offering to the SMSTurbo desktop version? Yes. SMSTurbo Online subscribers can upgrade from our simple ticketing offering to the full-featured SMSTurbo desktop version at any time. You can transfer data during your software implementation. 6. Can I purchase SMSTurbo Online for my company? SMSTurbo Online is currently available for pre-release preview. We are inviting interested parties to evaluate the application during a 90-day period before making it readily available for purchase. Contact us via our website and ask to be included in the SMSTurbo Online pre-release preview or send any questions you might have.